The first thing to do is clear an area large enough for you to roll out your puff pastry sheets with ease. I used a shop bought puff pastry from the supermarket for this recipe – predominantly because I was enticed by the fact that it was vegan. 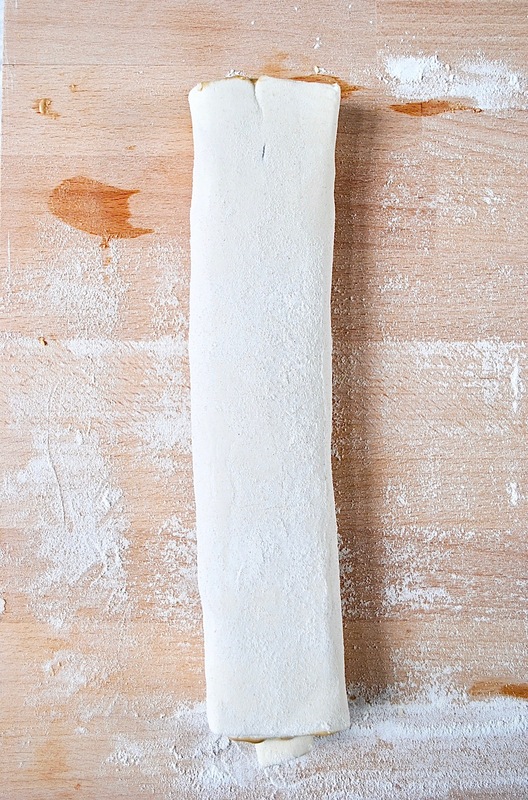 Of course, you can make your own puff pastry, but if you’re #busy then shop bought works great. 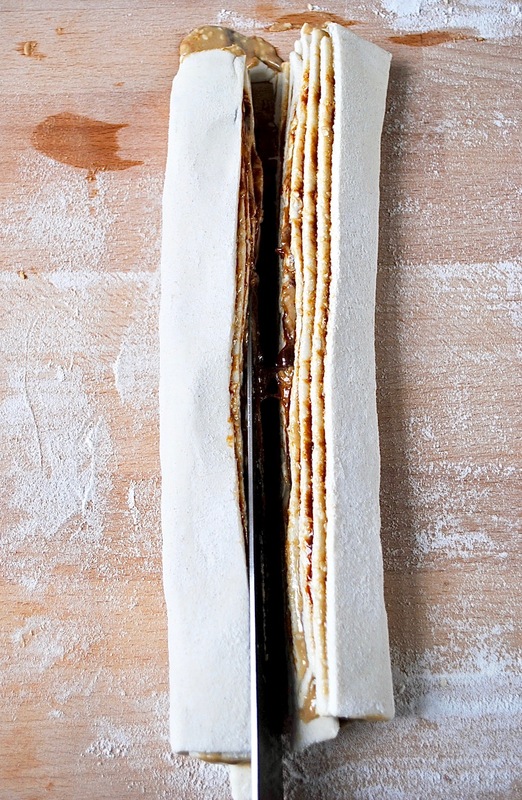 Once you’ve rolled out the pastry, cut it widthways into two. Now it’s time to have some condiment fun. First up, grab your marmite. Spread a thin, even layer over each of the rolled out sheets, leaving a 1 inch border around the edges. 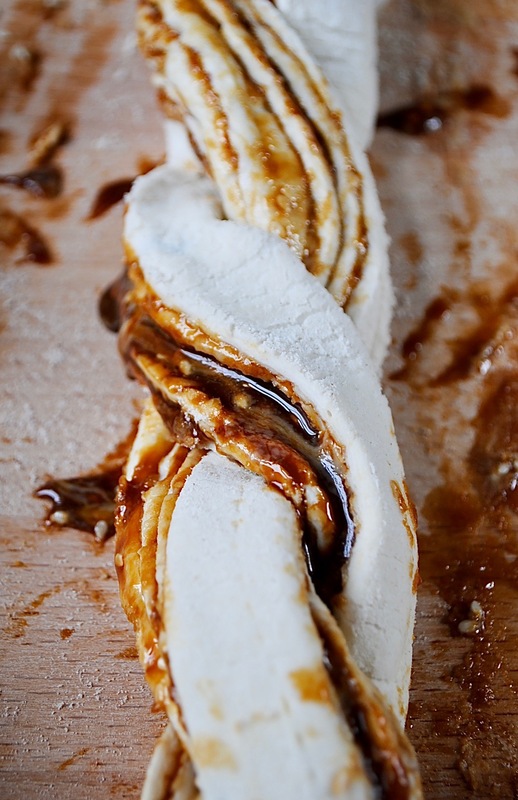 Don’t be tempted to pile on extra marmite – this will make it hard to roll the pastry sheet later on. 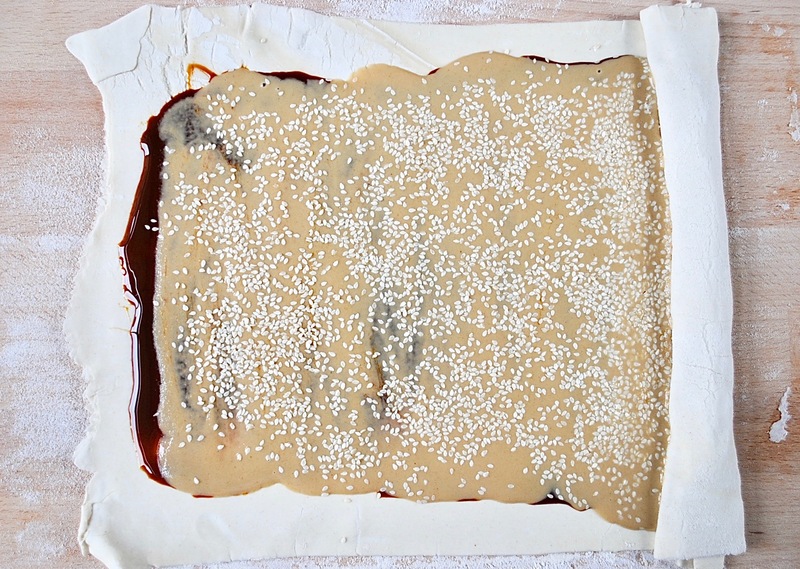 Once you’ve finished spreading the marmite, you can do the same on both sheets with the tahini. Spread it lightly over the top of the marmite. Remember to keep a 1 inch border around the edge of the sheet! Now for the fun part – the rolling. Beginning on the longest end, tightly roll up each sheet into a log. Try to roll the logs as tight as possible, otherwise they will end up excessively wide and difficult to plait at the next stage. Using a sharp knife, cut down the centre of the log, lengthways. Now you can start to plait/braid. Carefully twist together the two lengths to form a plait/braid. Once you’re done, pinch the two ends together to hold the plait/braid in place. Repeat with the second braid, and transfer onto a lined baking tray. Last, pour your plant milk of choice into a small ramekin or bowl and brush it over each twist. Finish with a sprinkle of sesame seeds atop each twist, then pop them into the oven for 20-30 minutes, or until golden brown and cooked through. Delicious! Are you up to date with my latest recipes? This Easy One Pot Vegetarian Chilli has your name on it! These puff pastry twists are equally delicious warm from the oven or cold as an afternoon snack or party nibble. The filling is rather rich, so I like to cut each twist into 2-3inch pieces. Kept covered, they’ll last up to 5 days before the pastry begins to dry out. Some final notes on ingredients: If you can’t find marmite or would rather buy a cheaper option like yeast extract (or Vegemite if you’re on the Aussie/Kiwi side of the point), that’s absolutely fine. As for tahini, I find that different brands can vary wildly in taste. I’ve tried most UK supermarket own-brand tahini’s now, and my favourite is definitely this one from Tesco. It’s super creamy and not too expensive. Even better, if you can find it, is this one. I could eat it all day! The puff pastry I use is from Sainsbury’s, but I’m sure that most big supermarkets will have their own version. Just make sure that it’s vegan, if you’re so inclined. Not all of them are. Well, that’s everything! It’s over to you. 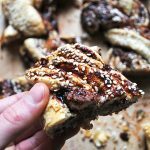 If like me, you love marmite and you love tahini, these vegan puff pastry twists are going to be right up your alley. I can’t wait for you to try them! Do leave a comment below to let me know what you think. 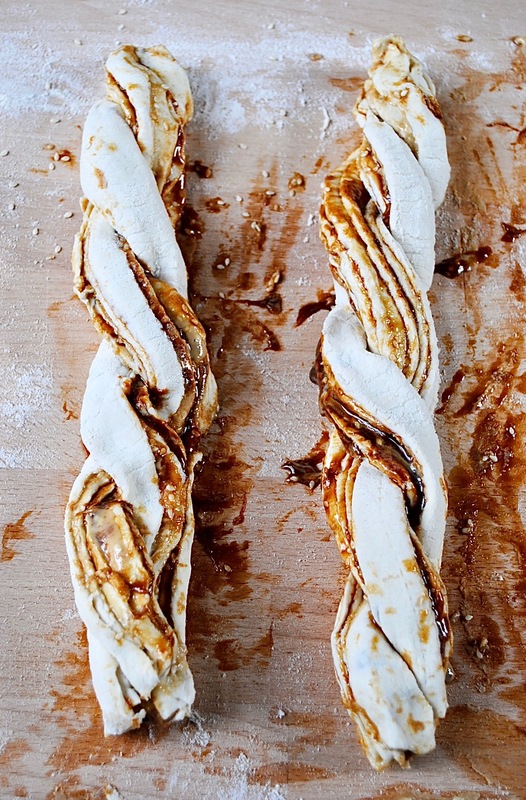 Will you be making these vegan puff pastry twists? 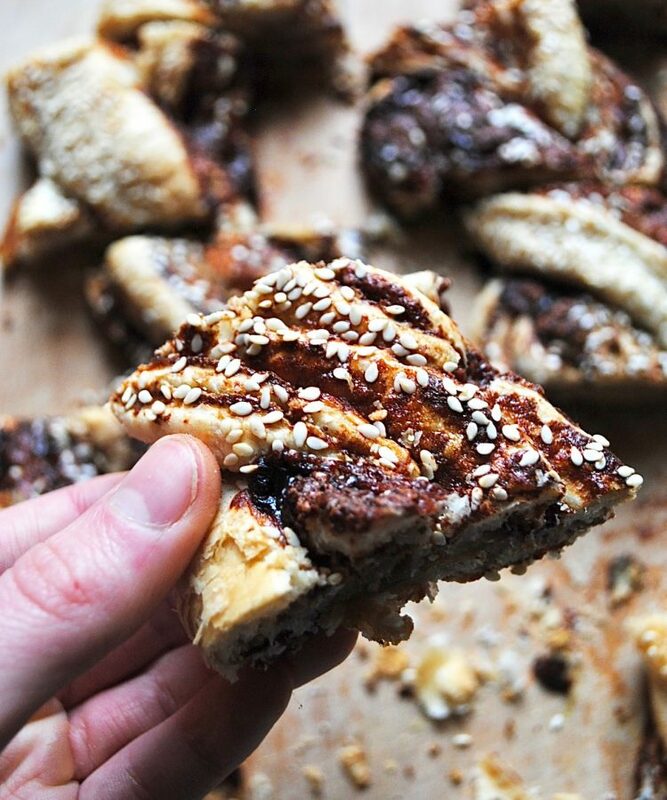 These vegan puff pastry twists are swirled with marmite, tahini and sesame seeds to create an irresistibly satisfying snack. You won't be able to stop at just one. First, roll out your pastry. Cut it widthways into two. 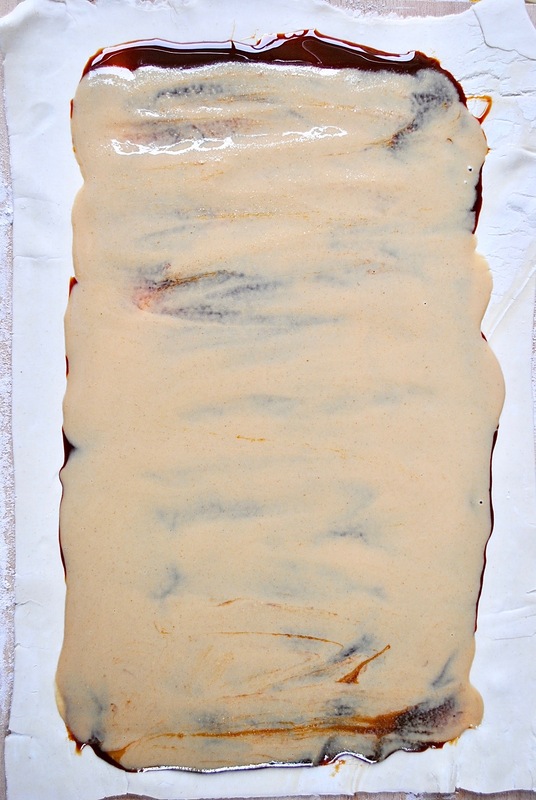 Spread a thin, even layer of marmite over each of the rolled out sheets, leaving a 1 inch border around the edges. 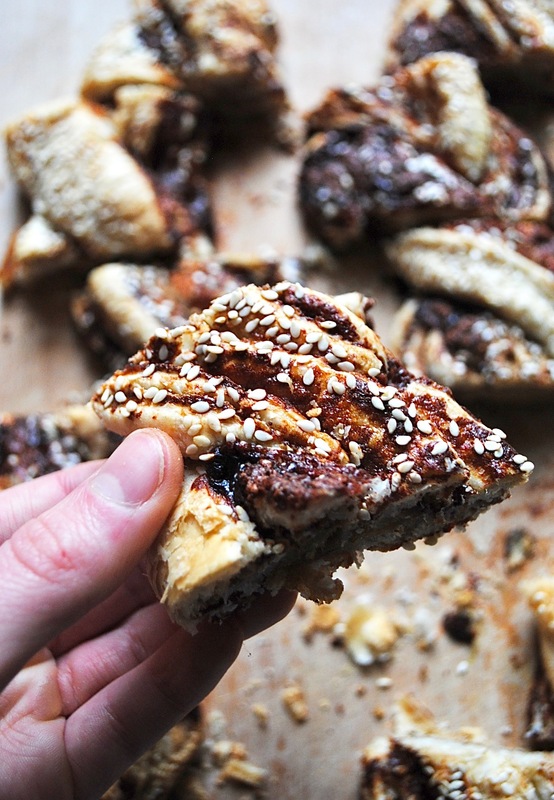 Repeat on both sheets with the tahini, spreading it lightly over the top of the marmite. Remember to keep a 1 inch border around the edge of the sheet! Beginning on the longest end, tightly roll up each sheet into a log. Try to roll the logs as tight as possible, otherwise they will end up excessively wide and difficult to plait at the next stage. Using a sharp knife, cut down the centre of the log, lengthways. Now you can start to plait/braid. Carefully twist together the two lengths to form a plait/braid. Once you're done, pinch the two ends together to hold the plait/braid in place. Repeat with the second braid, and transfer onto a lined baking tray. Last, pour your plant milk of choice into a small ramekin or bowl and brush it modestly over each twist. Finish with a sprinkle of sesame seeds atop each twist, then pop them into the oven for 20-30 minutes, or until golden brown and cooked through.